Derry City's Niall Logue blocks Keith Ward's clearance during Tuesday night's game at Dalymount Park. Defender Niall Logue was 'buzzing' after he played his part in Derry City's first win of the season at Bohemians last night. The 22-year-old slotted in alongside Darren Cole and Eoin Toal in a new-look three man Candy Stripes defence, which stood firm at a bitterly cold Dalymount Park. "Myself, Coley and Eoin keeping a clean-sheet was the first thing on our minds and for me to do it on my debut is a surreal feeling," he stated. "To pull on that Derry City shirt and have the game that I had with the lads is an amazing feeling. "Obviously coming back from the States was hard for me but knowing that I was coming back and signing for Derry City was an easy decision to make. For a local lad, who grew up supporting Derry City and then to pull on that famous shirt was a surreal feeling. "To come here and to have nights like this, play the way we did, where everyone put a shift in it was so good and I never felt a feeling like it to be honest." 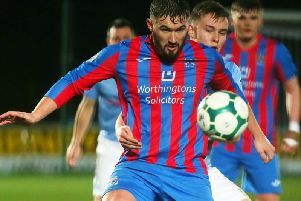 The former Institute man, who has spent the last two years in America with Ohio State University having switched from Yavapai College, Arizona, enjoyed his first taste of League of Ireland football. "I have always heard that the standard is really good and when you look from the outside in, it does look good, but you don't really know how good it is until you are playing in the league and there's some quality players in this league," he added. In City's opening two games of the campaign at Waterford and Sligo Rovers they didn't come out for the second half and the ex-Top of the Hill starlet conceded that was talked about in the dressing room at half-time. "In the opening two games at half-time we had plans for the second half but you obviously seen by the results we never executed them, but today the mindset was completely different," he explained. "We knew it was a hard place to come down to and the lads dug in deep and we just fought for each other for the full 90 minutes and to come away with a result is brilliant."